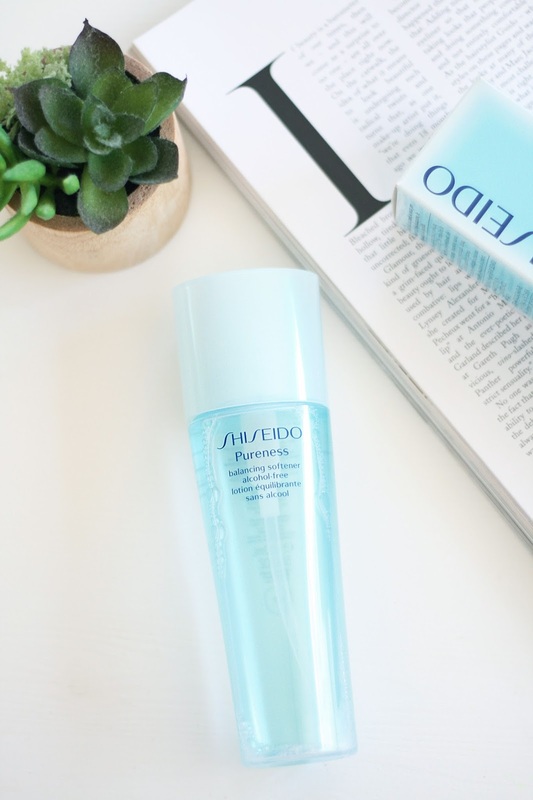 Shiseido - Pureness balancing softener | One of the main ingredients I don't want in my toner is alcohol even though its pretty good at combating oily skin, but for me my skin is quite sensitive so I was pleased to see this gentle product by Shiseido and couldn't wait to add it into my regime. At the moment by skin is definitely combination, I have an oily t-zone and quite dry everywhere else so I need something that will take care of both. I have been using this softener now for around a month and I have been liking it so far, it has a fresh pleasant smell which doesn't linger or aggravate my skin. I usually use two pumps on a cotton pad and gently glide over my face, it doesn't dry out my skin like many alcohol toners it actually feels pretty hydrated and plump after use which I LOVE! This product states that it is great for blemish prone skin, I'm having some troublesome breakouts at the minute due to hormones so it hasn't helped with that just yet but my skin texture feels lovely and smooth despite those naughty blemishes. Overall this is a very gentle product that calms and hydrates my skin quite noticeably, I love that it tames my oily t-zone but smoothes out my dry skin too, its just a trustworthy product that I will repurchase once empty. I bought this softener from Ulta for $24.50 which isn't too bad for a 150ml luxury product. I love the pump dispenser, its super easy to use with no mess and as always with Shiseido the packaging is super chic! Catch up on last weeks beauty post here.